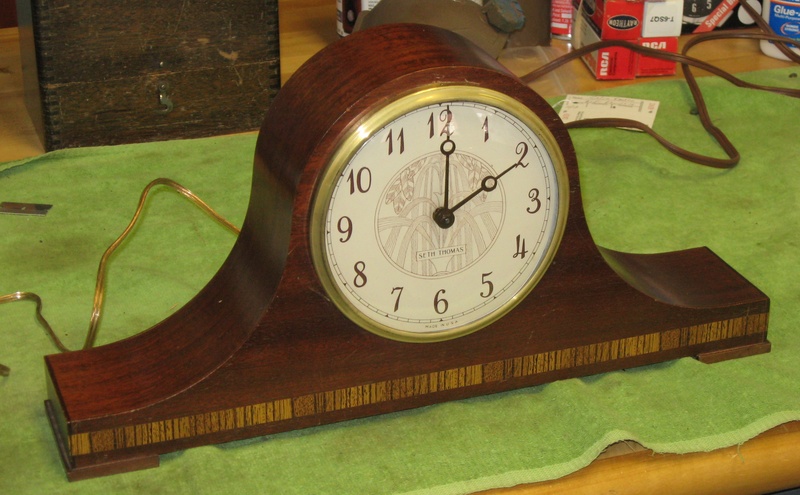 Here’s another example of a Seth Thomas electric striking mantel clock that I repaired. This one is dated October 1949 on the movement, and April 1949 on the motor. This clock is the Lynton Model No. E511-000. The case is mahogany with an inlay strip in front. It is 16 3/4 inches wide and 8 1/8 inches tall. The dial’s minute track is 5 inches outside diameter, and the minute hand is 2 1/2 inches long. This clock strikes the hour and half-hour on a single rod. Repair job 6241. 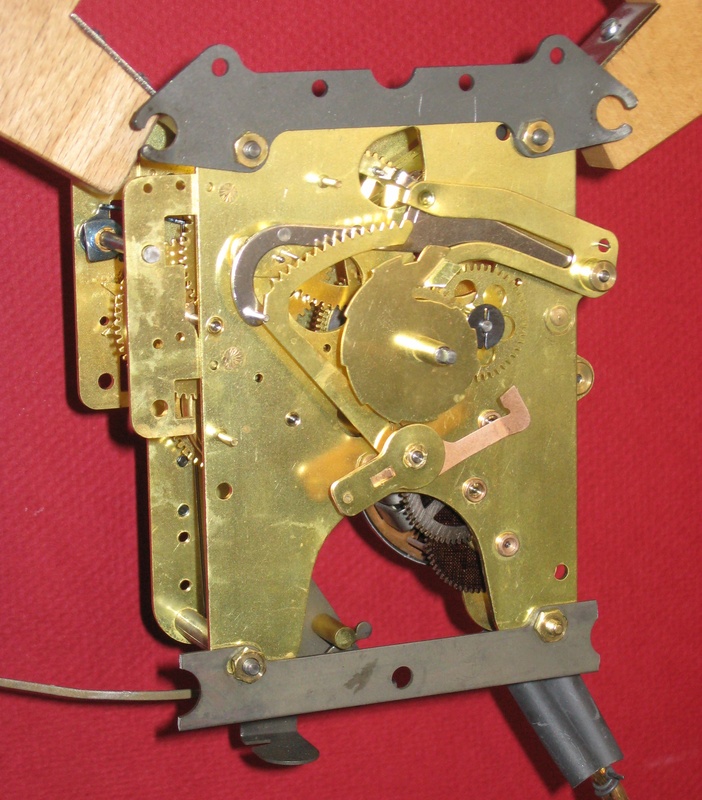 The movement is model A300-033 and has a date code 4910 (October 1949). The motor is a General Time Instruments Corp. M4 with a date code of 4 49. I polished the pivots and installed 11 bushings. 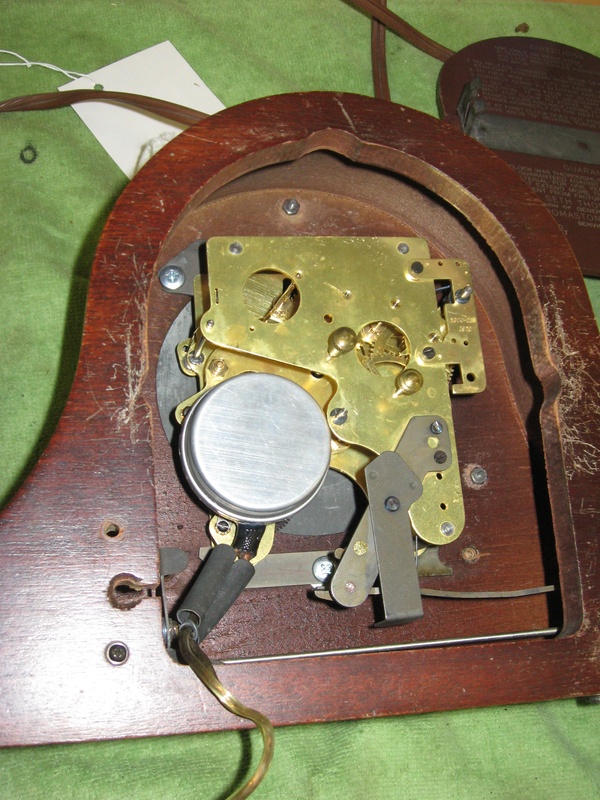 The lever that makes the chime is muted ,it keeps time the chime lever works it’s very quite. Looks like some of the felt is missing off the little hammer. How can I fix that? I have a Seth Thomas Electric Mantle Clock without an electric cord. It is not “hardwired”, it requires a cord that can be removed. The cord needs to be two pronged but the prongs are flat – not round. I won’t know if the clock runs until I find a cord. Do you have one for sale or do you know where I can find one? A local electronics shop said that they have a converter piece to allow it to take a two rounded prong cord, but I’d rather not change the clock unless necessary.